We are a 7 year old professional photography services company, specializing in Candid Wedding, Brahmin Wedding, Reception, Bengali Wedding, Pre-wedding Shoots, Engagement, Hindu Wedding, Sikh Wedding, Wedding, New Born, Birthday, Kids Portraits, School Events, Babies & Kids, Anniversary, Maternity and Special Occasion photography. We offer products and services such as Promo Videos, HD Highlights and HD Videos. We accept customized photography requirements. Our studio is in Durgapur. We cover events in West Bengal, All Over India. We are comfortable communicating in Nepali, Bhojpuri, English, Bengali and Punjabi. Extremely talented persons they are. Came at our occasion and conquered by their work.lovely approach.good behaviour.happy to work with them.Also happy with their output.thanks to them. Dhruv Sharma is an extremely talented photographer . His dedication towards his work was enough to make my special day absolutely mesmerising and memorable .I was completely overwhelmed with his creativity. I have alredy recommended him to all of my friends.best wishes Dhruv Sharma as we have lot more to see your work !!! Keep shining . NSB did a fabulous job of capturing my son's beautiful moments which we will treasure for liferime.The team was punctual, accomodating in understanding the little tantrums my 7 month kid had and professional. For any special occassion i would refer him for myself , friends and family members. Thanks to theWHOLE NSb Team For Capturing Our Special Moments . Super Punctual On Time Which is now a days very Important . excellent photography done in my event , a really good experience to deal with and such a wonderful team who will completed very nicely. Trust me its worth buying. Superb photography skills. Really happy with their service and package provided. Would like to thank personally Mr DHRUV . Their in-depth knowledge and friendly nature made it an overall wonderful experience. Would surely recommend and in future will contact again. Keep up the good work guys. Cheers!! A creative young and vibrant group of people coming together to create magic on your special day and capturing moments like you never could imagine.. Team NSB is extremely dedicated and passionate about their work and is an example of how your love towards something can bring out the best in you... my entire wedding package was done by them and it was the best decision i took.. Friendly team while being professional at the same time. Loved shooting with them. They did not rush us through the shoot and patiently worked with us.Highly recommended. The service was very good and the album was very excellent. I am very pleased about his service. I won't hesitate to take his service again and I will be delighted to recommend him if anybody needs this type of service. They are too good, I would like to book NSB again for any kind of programme in my house. Excellent photography by Dhruv sharma..
everything we had hoped for and more! SO glad we found you! Photography and videos were good, just that the other team with him was little unprofessional and missed out on some vital key clicks and shots. Dhruv was more like a family member so felt very easy to work with, he never said no for anything. Great professionalism and skillful.. The candid was great.. The lightings were great... Delivery of photos and videos were on time.. Understanding of the situation was also great... There coordination was wonderful. Really it's very nice and good experience with this team.i always use and want to work with this Photographer in my all family programme. They are very professional and friendly with my family. They are really very creative in their work, and cooperative too with the clients. 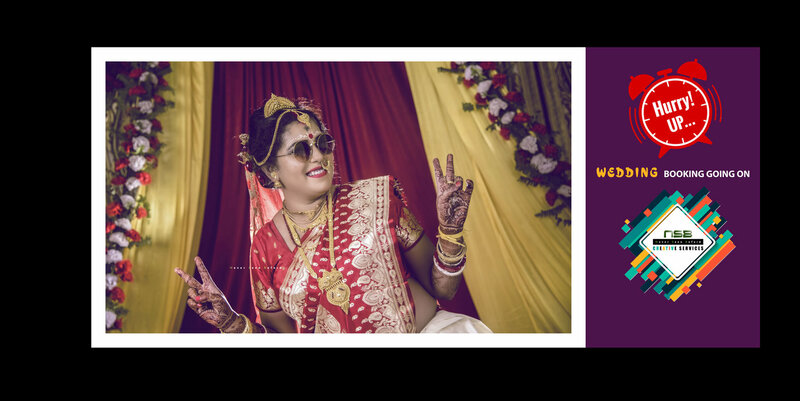 The photographs are so clear and beautiful , most importantly how they have edited is absolutely perfect I would recommend to all my realatives to hire them in their special occasion. A genuinely, dedicated person about his work and a kind hearted person with a friendly behaviour. His specialist in how to impress customers through his work. He is really creative in taking shots & has a very good work etiquette. you can work very comfortably with him & creats a very friendly environment where any bride can pose freely (even if she is not very easy with lights & camera). Never Seen Before team is great to work with.They stand up to their commitment.Delivers great photography and videography and are also open to new ideas and innovations that add great dynamics to the team.Super happy to have chosen NSB. There work is too good with professional skills.... I loved there work...i found there work as the best one in durgapur.. I would like to recommend there service to others.. Thanks to mr dhruv sharma for the excellent work of videography. One of the Best cinemaker. I love the Editing. Canvera also Give a Good Printing Quality. Good creation as per the situation made by nsb is excellent and time punctuality and working etticates are excellant . Staff behaviour are also good . we are tension free on there work performance. Further wish their professionalism should maintain in future also. Your message was successfully sent to NSB (NEVER SEEN BEFORE). The Photographer may contact you soon.